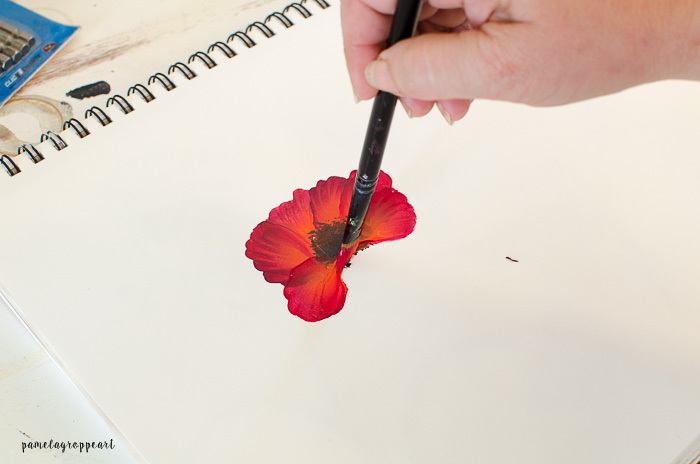 How to Paint a Poppy in acrylics one easy stroke at a time. 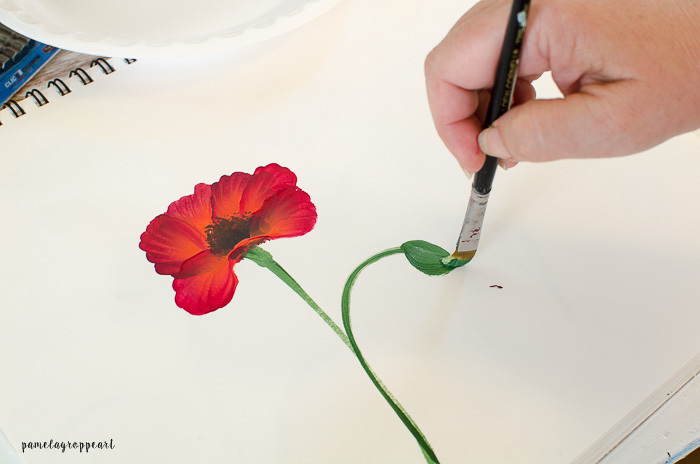 Poppies are such a friendly flower and painting them can be so much fun. Paint a field of them or a still life. Paint them in different colors if you choose. 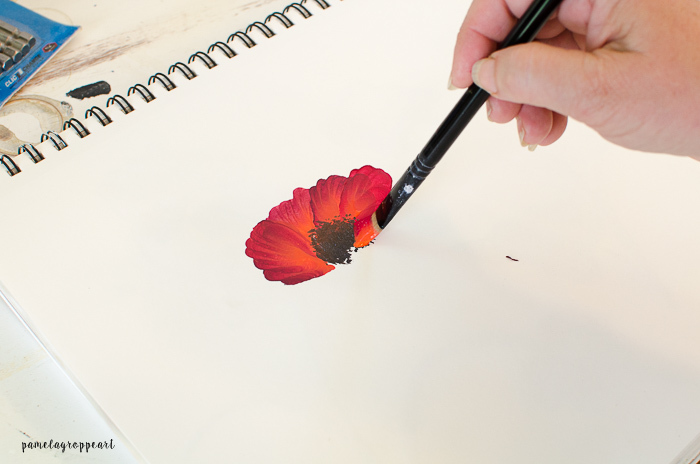 In this post I am going to show you how to paint a poppy in acrylics. 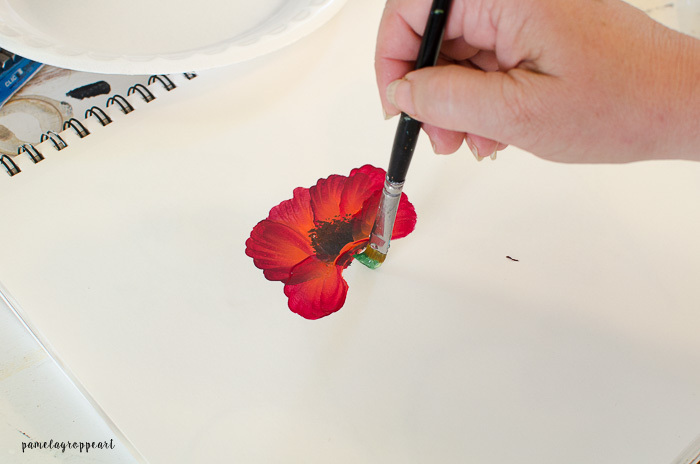 I love painting poppies as much as growing them. 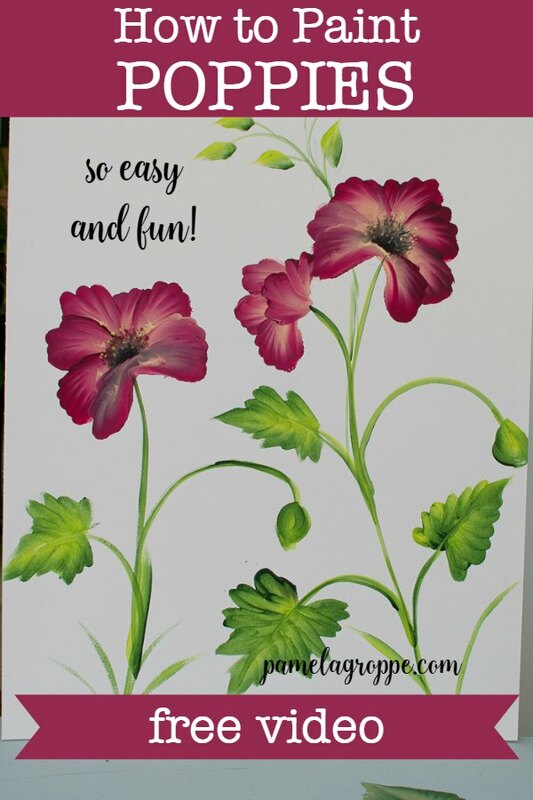 Recently I shared how to paint a large red poppy and now I show you smaller versions. 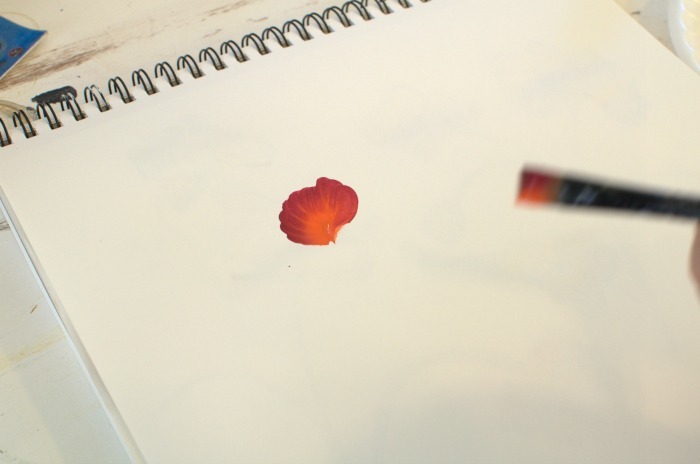 In this tutorial I have chosen red but you can paint them any colors you wish. No time now to read, PIN for later! This is going to be so much fun! I loved doing this tutorial and the video too. I want to paint a canvas of these and, of course, I will share when I do. 1. First we double load our #12 brush with one of the Wine colors or Crimson and Orange. 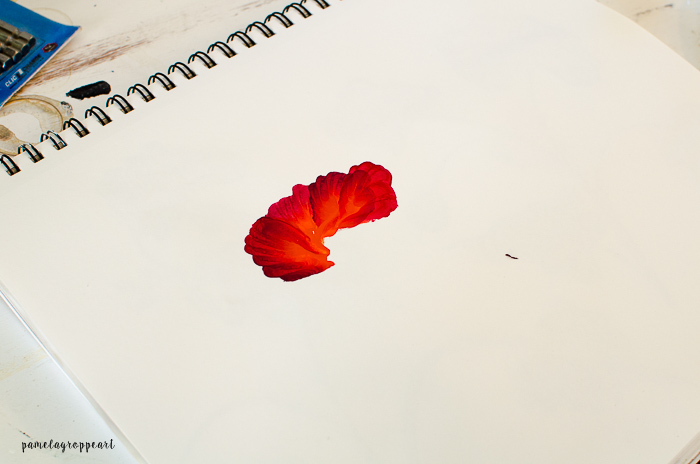 No need to be perfect, this petal is going towards the back of the flower and will be overlapped. 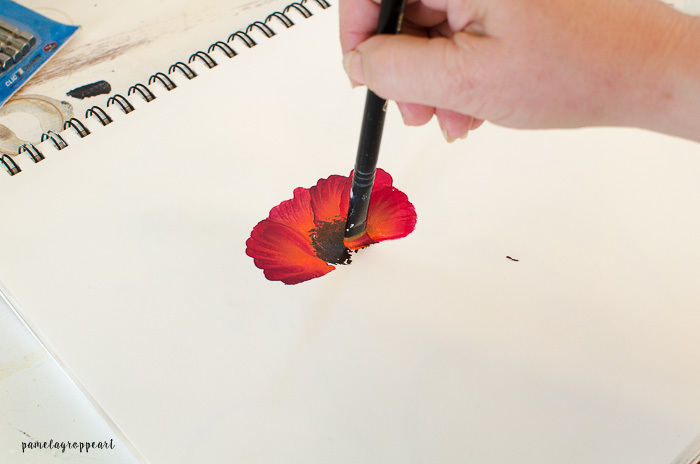 If you have seen my Pansy painting tutorial you will find this same stroke there. 3. Do another of the same stroke on either side of this one overlapping it a bit. 4. Add a fourth if you wish to as I did, but play it by ear or maybe I should say eye. 5. Dip a scruffy brush in Burnt Umber just on one corner, and a smidge of black, the tiniest bit of black. With black, a little goes a looooong way. 6. Pounce or stipple on a round center keeping the black to the bottom. 7. You can let that dry or you can go ahead and go over the center while it is wet, it will pull some of the brown and black into the next stroke but that is not always a bad thing. The choice is yours. 8. Double load your #12 brush with the Wine and Orange colors again and start another scallop stroke, you will note I am overlapping the center slightly. About halfway or a bit more through the scallop stroke you will lift your brush and drag it to the center instead of finishing the scallop. 9. Do the same on the other side of the center. If your brown and black was still wet you will have some of it streaking into the red and orange but that adds interest and some shadowing. 10. Now clean your brush and double load it with some dark green and Foliage green. 11. 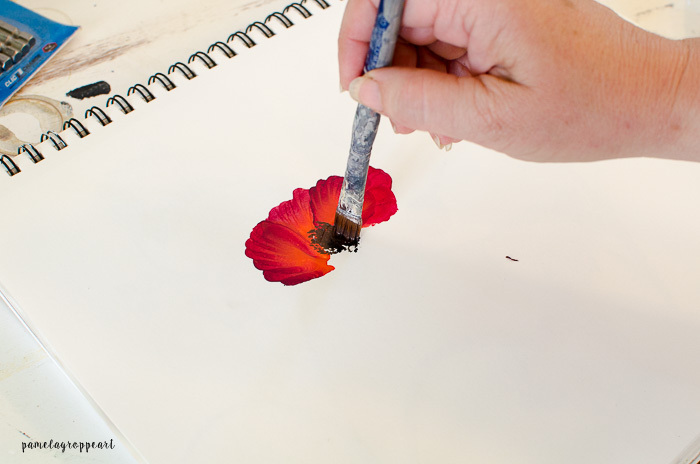 Drag your brush on the chisel edge down to create a stem, lead with the lighter color. 13. To make a bud you can either do 2 C strokes that meet our do a loop stroke to create the bud. The video does a great job of showing you this it is around 5:30 on the video. The leaves are another entire post but you can see them done on the video right now if you don’t want to wait for that. So go paint up a bunch of poppies. Paint them on furniture, pillows, garden art, you name it. Surface, your choice, I painted these on a painted board and some on painting paper. Want to get painting tutorial updates straight to your inbox? 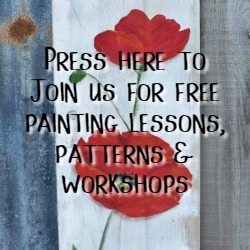 Plus you get access to the Resource Library full of free patterns and more. 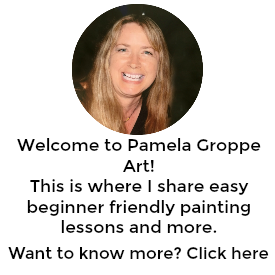 Just sign up by clicking the button in the red bar at top, we would love to have you join us! More Painting Tutorials You Would Enjoy!